Rest and refresh at the 100 percent smoke-free Comfort Inn and Suites and Conference Center hotel in Mount Pleasant, MI. 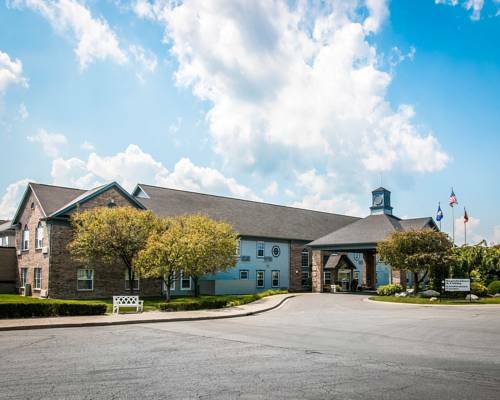 This pet-friendly hotel is conveniently close to Central Michigan University, MBS International Airport, Mount Pleasant Meadows and Soaring Eagle Casino. Get ready to take on the day with such amenities as free WiFi, free parking, free hot breakfast, meeting room, fitness and business centers, indoor pool and restaurant. Behind every great day is a great night your guest room, which features a refrigerator, microwave, coffee maker, hair dryer, iron and ironing board. Also, earn rewards including free nights and gift cards with our Choice Privileges Rewards program. - Mt. Pleasant Munic. Arpt. A Y-shaped bridge that crosses three rivers at once. ~26 miles from Mount Pleasant. Odd local landmarks that were the handiwork of 1980s high school students and a mysterious 1930s Bulgarian. The tower is made from old CCC bunkhouse bed frames. ~40 miles from Mount Pleasant. ~50 miles from Mount Pleasant. ~58 miles from Mount Pleasant.